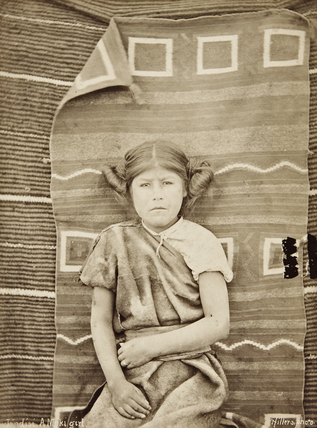 Portrait of a thirteen-year-old Hopi girl (named Modisi), pictured sitting in front of two Navajo blankets. She is wearing her hair in two large coils, a style typical of unmarried girls. Due to the nature of these images, prints will reproduce any signs of age, wear or damage that occurred before they were archived by the Pitt Rivers Museum.